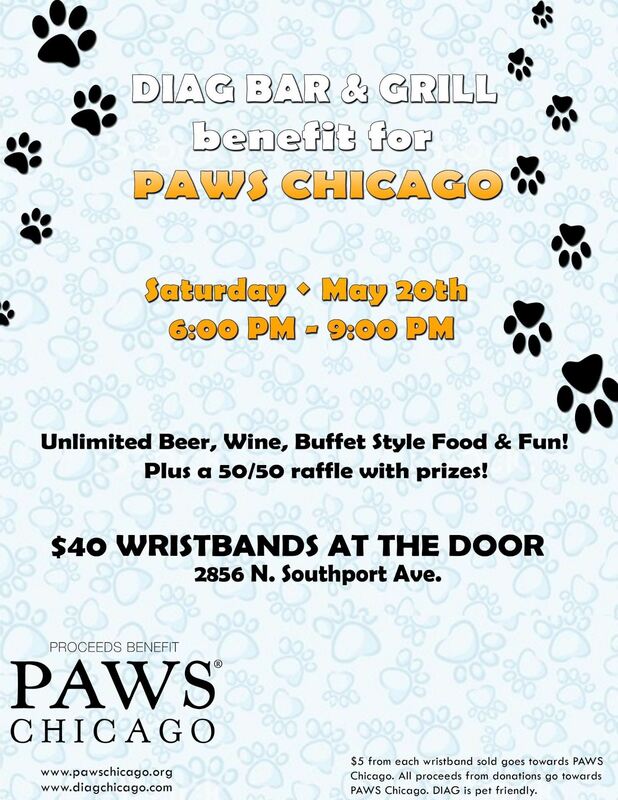 Our group chose to raise money and hold a fundraising event for PAWS Chicago, which is a no-kill animal shelter in Chicago, Illinois. To begin our project, the team developed a comprehensive implementation plan. The two main activities at the onset of the project were to (1) contact PAWS Chicago to get approval on the event and any support materials, and (2) identify and select a location to host the event. 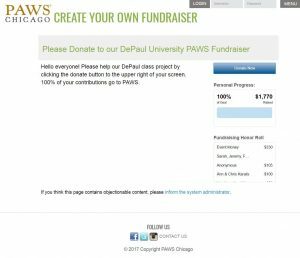 Our initial inquiries to PAWS Chicago received limited response and it took over a week to complete the necessary application and approval process. 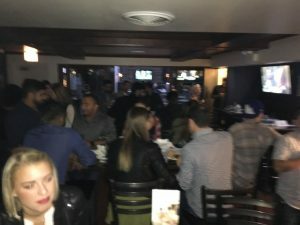 The selected event location was DIAG Bar and Grill, which is pet friendly bar that offered unlimited beer, wine, and appetizers for $40 over three hours. We scheduled our event for Saturday, May 20th and began to prepare by getting flyers and a donation box from PAWS, setting up an online donation portal, designing an event flyer, sending out invites, and securing raffle prizes. 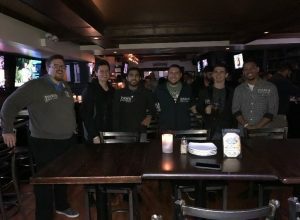 On the day of the event, the team showed up about an hour early to setup. DIAG Bar and Grill had reserved about a quarter of the bar for us and we were able to position a donation table at the front of our section. 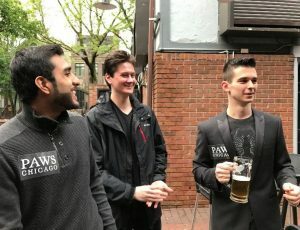 As guests arrived, we would talk to them about PAWS, sell raffle tickets, and help them secure a wristband from the bar. 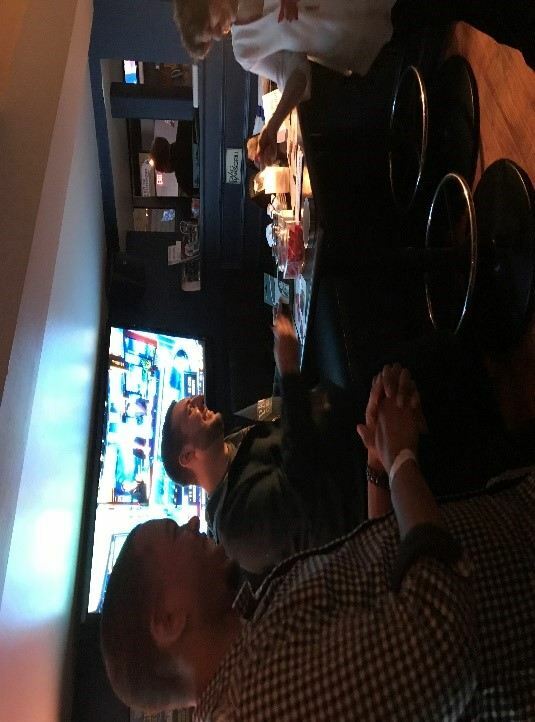 The event went smoothly with $330 raised and about 30 attendees. 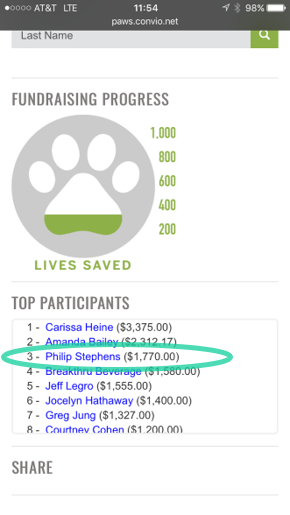 Additionally, online donations brought in $1,440, netting a total of $1,770 in donations for PAWS. To transform animal welfare by setting higher standards in the way animals are treated and developing a sustainable, solutions-based model. 100/100 Financial and Accountability/Transparency score. We changed the charity to support (originally GFDC) because another team had selected them, which delayed our project start about a week. 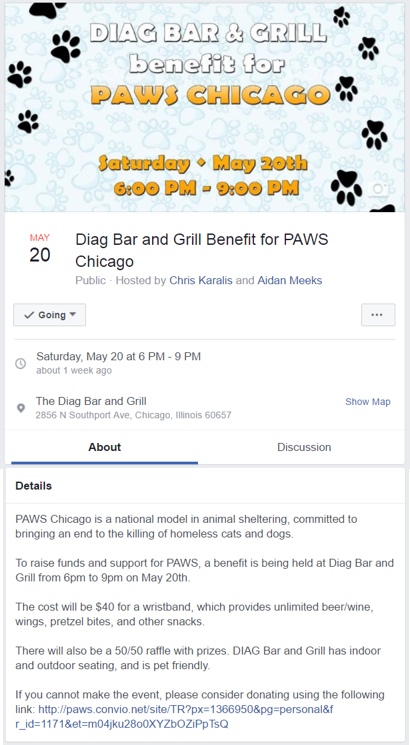 Diag Bar and Grill did not get back to us right away with dates for the event, which limited the potential weekends to host the fundraiser. 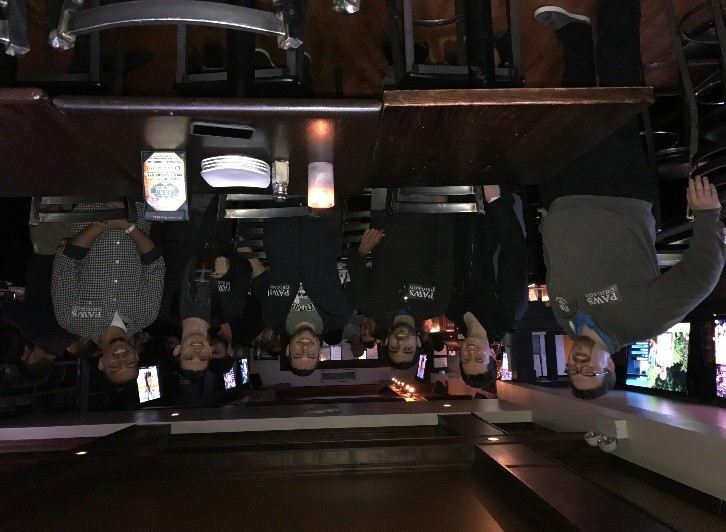 Scheduling conflicts within the team also reduced the possible days for the event. 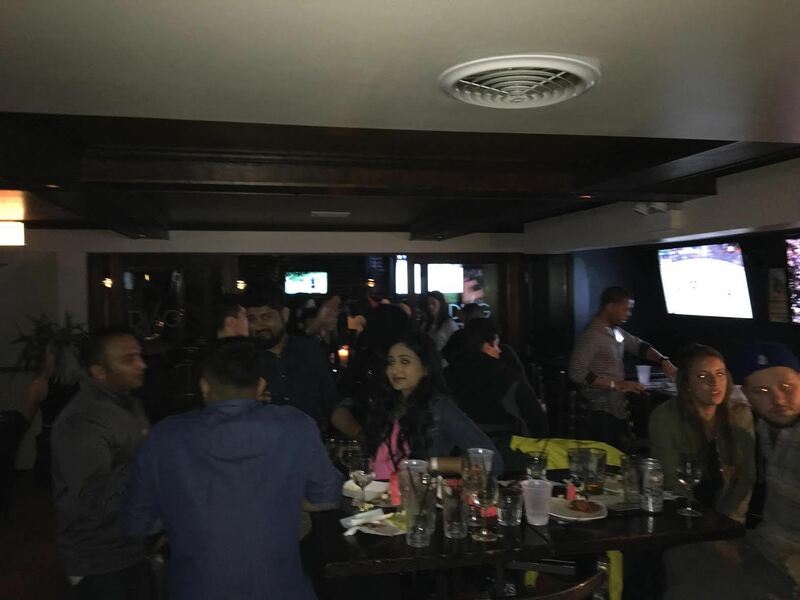 Other groups also held their event on May 20th, but due to the limitations listed above, this was the best date for our event. Diag Bar and Grill had a nice outdoor patio, but it went unused most of the night because it was cloudy and rainy. The poor weather conditions also could have resulted in invitees not attending when they would have otherwise. 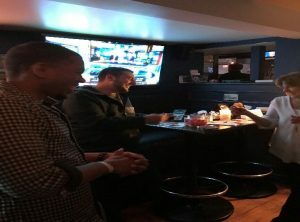 A birthday party of 12 people had committed to attending, however, a friend’s flight was delayed into the start time of our event, so the party decided to make dinner reservations instead. Rapid responses between members is critical. Slack app (highly recommended for group based work) worked well for group communication. Google Drive worked well for sharing documents and collaborating. 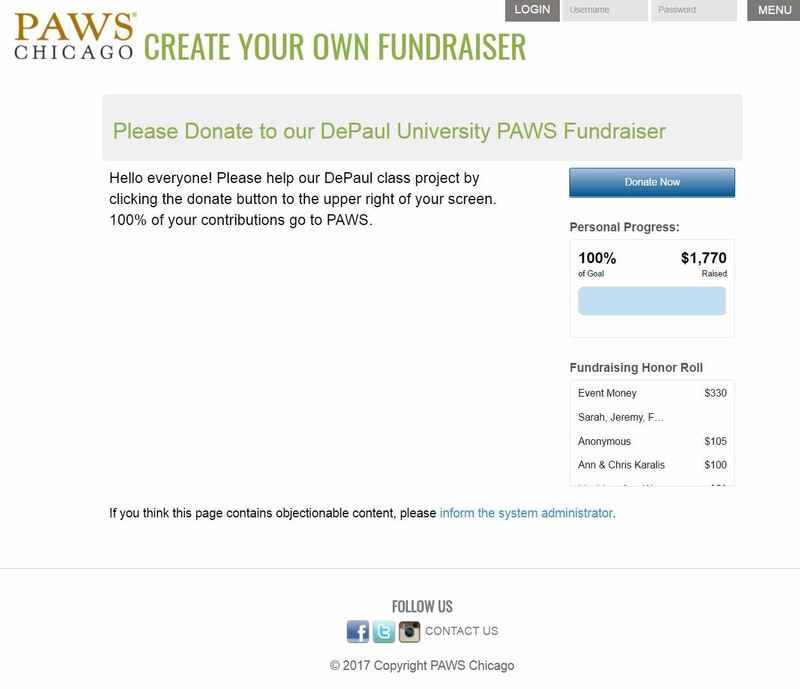 The PAWS Chicago donation link really helped drive online donations. Having a checklist ensures activities get done on time and in an orderly manner. 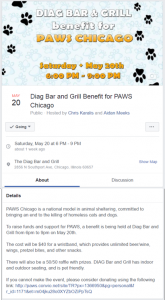 Diag Bar and Grill and PAWS were not quick to reply to our inquiries. Calling instead of emailing helped to decrease lead times.